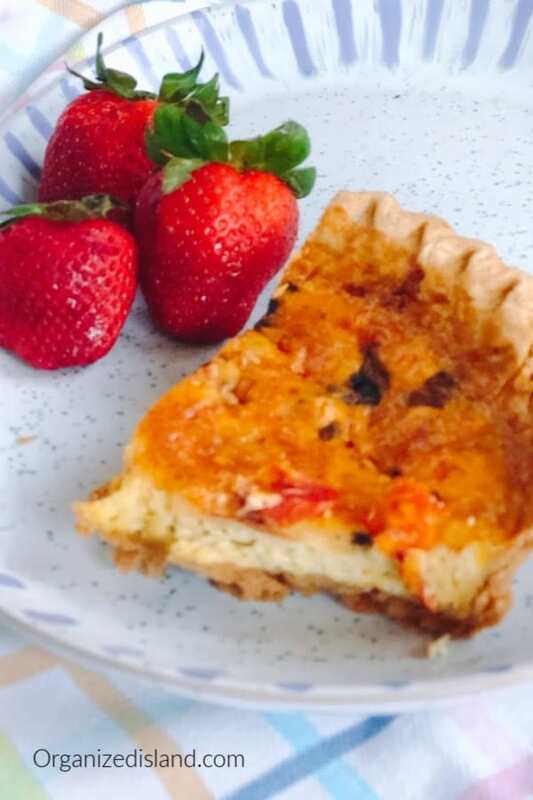 This Easy Tomato Quiche Recipe is perfect for a breakfast or brunch and is super simple to make. We made it with a frozen pie crust, but you can also make it with a homemade crust if you want. Hello Friends! Are you getting a chance to savor the moments of spring? I have been intentionally creating more time to celebrate moments with friends and family. Now is the season for iced tea on the porch or balcony, fresh flowers and morning brunches and afternoon teas. I recently hosted a tea for some of my friends that are really more family and we were lucky to have a warm, sunny day. Brunch season is really year round, but spring and summer bring additional opportunities of enjoying an al fresco brunch don’t you think? This vegetable quiche recipe is perfect to whip up for brunch or breakfast and does not take long to prepare. 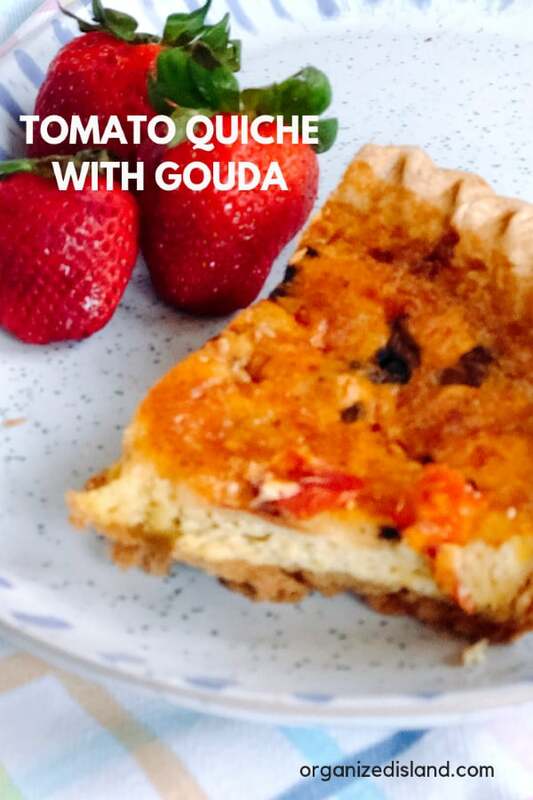 This tomato quiche is made with mushrooms, cheddar, and gouda cheese. I love the creaminess and ________ that gouda cheese adds to the dish. You can omit the mushrooms if you want, and you can even add another vegetable in its place if you want. Bell peppers and mini peppers can and colorfulness to the recipe while adding flavor as well. This recipe goes wonderfully well with salad, salsa, and soups. Also fantastic with fresh fruits of the season. 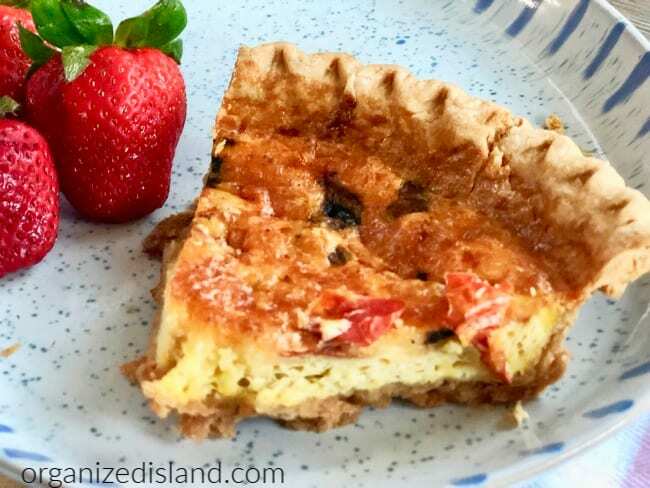 This easy quiche recipe is made with frozen pie crust, but you can use a refrigerated pie crust too. 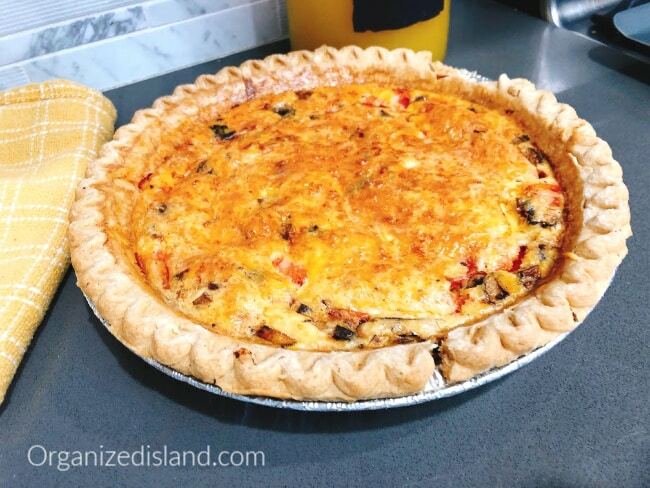 If you are looking to make the quiche without a crust, you can raise the oven temperature to 375, pour the ingredients into a greased pie pan and bake 25 to 30 minutes or until knife inserted in center comes out clean. Bacon Quiche – A cheddar and bacon quiche that is so perfect for breakfast, lunch or a mid-morning snack. Be sure to check out my time-saving tips noted at the end of the recipe. If pie crust is frozen, thaw out. In mixing bowl, beat eggs, nutmeg, and salt. In a skillet, saute tomatoes and mushrooms in butter on medium-low heat about 3-4 minutes. Place vegetables in pre-baked pie crust. Add egg mixture to pie crust. Sprinkle cheddar and gouda cheese over egg mixture. Set pie on cookie sheet. Bake at 350 ° for 24-30 minutes until completely set. The quiche will last in the fridge for a few days. Keep frozen pie crusts in your freezer and you will be ready to make this nearly any time. All you need are eggs, cheese and a vegetable or two to put this together. You can also add bacon, turkey or ham to the quiche and it is ready in about 30 minutes. I just love gouda, and I just love quiche. Such a winning spring brunch dish!